So I've sat on this a few days to try to clear my head and get some real thoughts on this. Kublacon 40k was a bunch of fun, but it always seems there is just 'something' that goes sideways about the event. Sometimes it is the missions, sometimes it is the odd paint scores, but this year there was a 'weighted' system implemented. You see the TO thought that with some codecs being, well... better than others there needed to be some type of factor to help even the scale out for those books that aren't as good. So he basically ended up grouping any dex that had 3 or more armies together, taking an average, and then creating some type of 'multiplier' for that army. If you had less than 3 dexes you were wrapped into the forces of good or forces of destruction. So first a bit of stats. First up the break down of armies. A nice turn out and a mix of armies that is... uh, I don't know. No DE and no BT, though the later is not as surprising. I think if you had said 6 GK and 4 BA I would have not been surprised. So in this unweighted sheet how did the best general go? Here are the top 4 placings and their battle points. This is the 4 guys that went 3-0. The orks are not me sadly though I was happy to see him go 3-0. Now I'm not going to ding the GK or the BA guy, but hat's off to the bug player for getting max battle points and the ork player for going 3-0. So how does that affect the overall top 5? So our Nids player that won had a great looking army and was really overall on top. The GK player also had a great army and he came in second. 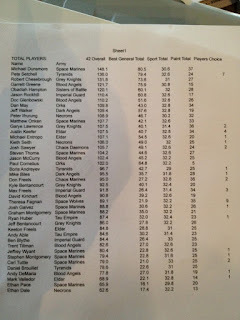 Now the marines and orks (me) went 2-1 but also scored well on the other soft scores. So you look at all this and think 'fine fine, nothing horribly surprising there.' But then we added the weighted score in to this. So... ok. Now the overall looks like this. Uh... so basically in a plan to help even out the codexs a space marine army that went 2-1 gets best general over the bug player that got full battle points? Really? And the guys that did well with GK and BA slide a place down (and swap)? That doesn't seem very... effective I guess. 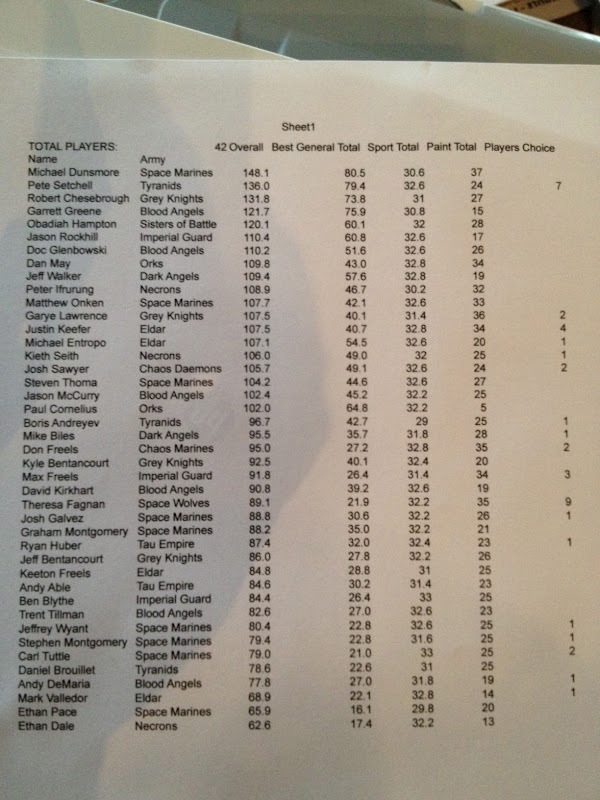 So wow, not much change from battle points when suddenly guys are score 20 pts over the max 60 pts in best general. I end up sliding from 4th to 8th because my battle points GO DOWN when everybody ahead of me go up. Clearly the orks/csm/daemons need to be nerfed because they are TOO LEET. I as basically less than 4 points lower than the Sm player in the unweighted, but ALMOST 40 POINTS lower than him in the weighted. WTF? I don't know, maybe I'm just not getting it. I have no idea how this system was supposed to make this feel like it improved the game. I think we all get that some codexes aren't as good as other but we know good generals can do well. This is seen in my category of 'forces of destruction' in that even though there were only 4 of us we all did pretty well. So this translated to 'your dex is too powerful' and dinged we got. For the same reason I don't think it was worth punishing a BUG player of all people because I'm pretty sure everyone agrees they don't have an overpowered book (though I still think it is good). I think the Marine player would have been thrilled going 3rd overall, just like I am happy that my unweighted overall would have been 4th. And really I keep coming back to the fact that if I had known such shenanagins would be in place I would have just brought my 1ksons and gone for paint. Instead this was a surprise and that bothers me just as much as how little the weighted system made sense. Oh well. I take solace in the fact this is my last fifth edition tournament. Too bad it ended on a weird note. And I'm not just trying to take a big crap on the TO. The even ran smoothly and it was fun. I just am mystified by all of this weighted stuff. I'll do a quick post soon to chat cover my games which were of course the fun part! That's ridiculous. Any TO that's puts a system into place like that one is just pushing their own opinions on game balance. This is a perfect example of how it never works. A Nid player got screwed? I don't mind soft scores for painting and sportsmanship, but any system that tries to have any hints of comp just mangles the results.